(JTA) – Marine Le Pen, the far-right candidate in the French presidential elections, said she would ban halal slaughter of animals if she is elected, along with any other method of ritual slaughter without stunning. Le Pen, who finished second with 21.5 percent of the vote in the first round of the elections Sunday, made the statement Tuesday on halal slaughter during a campaign visit at a meat market near Paris. She did not mention shechitah, the kosher slaughter of animals, but did say she wanted to outlaw any slaughter of animals without stunning. Her National Front party’s showing on Sunday was the best electoral result in its history and the second time it made it to the second and final round, which will be held May 7. Both halal and shechitah require animals be conscious when their throats are slit — a practice that critics say is cruel but which advocates insist is more humane than mechanized methods used in non-kosher abattoirs. Muslims slaughter animals in a similar method to shechitah, albeit with fewer restrictions, to produce halal meat. In her statement Le Pen, who has called for a shutdown of immigration from Muslim countries, a ban on public prayer and the wearing of Muslim religious symbols, referenced halal slaughter specifically. “I would say that I think that 90 percent of abattoirs are halal” in the Paris region, Le Pen said. In Europe, the Jewish and Muslim customs have united opponents both from liberal circles who cite animal welfare as their main concern and right-wing nationalists who view the custom as foreign to their countries’ cultures. She has said during the current campaign that she would ban the wearing of kippahs in public in France in order to facilitate a ban on Muslim clothes. She has also said that she would make it illegal for French citizens to have an Israeli passport. Le Pen has called on French Jews to make these “sacrifices” to curb radical Islam and has promised to be French Jewry’s “shield” against Islam. French Jewish leaders have called Le Pen a “candidate of hate” and urged voters to support the leading candidate, centrist Emmanuel Macron, to keep Le Pen from winning. He won the first round with 23.7 percent of the vote. Polls from Tuesday predict he would win the second round by more than 20 points. 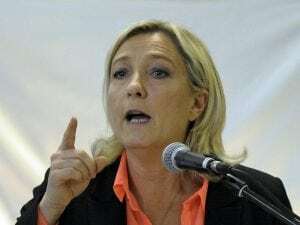 French Chief Rabbi Haim Korsia accused Le Pen of “fomenting hatred and war between the government and religions, as well as interreligious animosity” with her statement. “It undermines the foundations on which France was built,” he said in a statement.